Arctic Cool is an American company that offers shirts, shorts, hats, and towels with a state-of-the-art HydroFreeze X Technology. This cooling management system reduces the fabric temperature during activity. 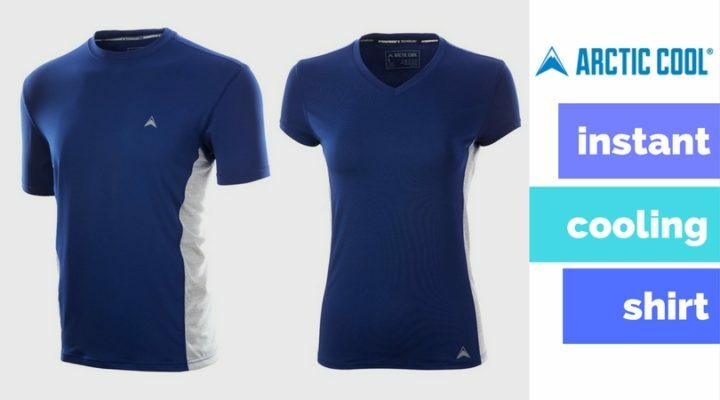 The draw of cooling technology, relaxed fits, and machine washable anti-bacterial fabric made me excited to try out the Women’s V-Neck Shirt. This design wicks moisture away from skin and disperses it throughout the garment, keeping you dry and relaxed. The fabric provides full range of motion for all types of activities, such as running, cycling, and yoga. Sizes come in mens’, womens’, and girls’. The Instant Cooling Shirt makes it easy to stay cool (down to 30 degrees cooler) while you stay active. Another bonus is that the cooling fabric blocks 98% of UV rays and is rated as UPF 50+ for sun protection. This is perfect for those hot and sunny days where you want to stay cool and comfortable! 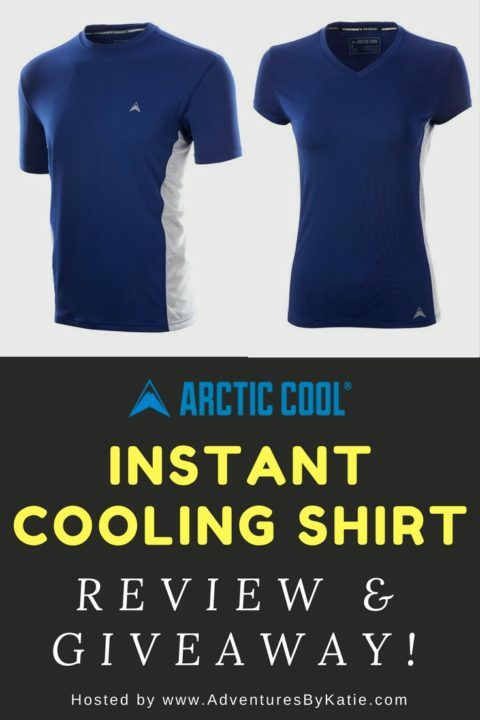 The Instant Cooling Shirt is AMAZING for hot outdoor runs during the summer (or if you live in a year-round hot climate) because it really does cool you down! I also like that it helps protect you from the sun. Now, you might be thing: “Why do I need cooling technology in the winter?” Well, in a lot of places it isn’t always freezing out during the winter! Here in Virginia, it is still in the 50s and 60s on some days! I wore my Cooling Shirt on a run the other day, and it really helped me to feel nice and comfortable. Unfortunately, the cooling technology does not work if you wear additional layers, so it wouldn’t necessarily be good to wear outside on colder days. The cooling technology is also great during the winter if you work out in the gym. I ALWAYS get overhead in the gym, and this Cooling Shirt is a lifesaver! Not fitness related, but this shirt would be awesome to have while on vacation at Walt Disney World or a Disney Cruise! My favorite thing about the Arctic Cool products is that everything is AFFORDABLE! The most expensive item is $34.99. What a steal! Any of the Arctic Cool products would make great holiday gifts this year! I know I will be picking out a few shirts for my family and friends! The winner can pick his/her choice of ONE SHIRT. 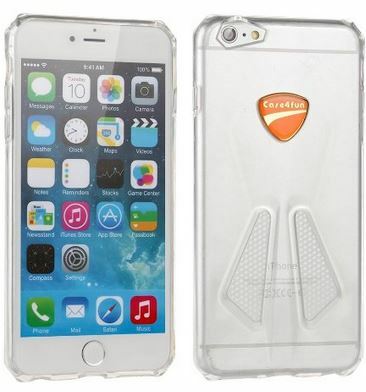 Product will be shipped directly from Arctic Cool. The giveaway is open from December 1-December 8, 2017. This is perfect for a Canadian winter with all of the comings and goings into the heat and out the cold, and repeat infinitely. it would help keep my cool while working out. it would help keep my cool while working out! Going in and out from cold to warm and exercising outdoors, this would be useful to maintain a decent temperature. Perfect for working outdoors in the heat! I love that this would be perfect for the heat and cool weather! I am excited because it get a so hot running here and this would help keep me cool while and after running! I would love to win to have a workout shirt. I would love to give the shirt to my dad. I run so it would be nice to not feel so so hot whilst running! Next story New Year’s Day Races to Run!